The Care Systems Time & Attendance Kiosk is one of the new developments that the Care Systems Development Team have been working on. 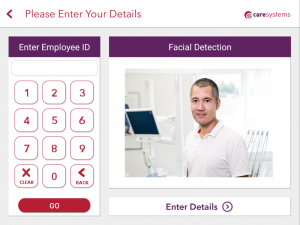 The Kiosk combines Image Capturing capabilities and Employee ID to log the start and finish times of your staff; interfacing with both RostCare and TimeCare. The Time & Attendance Kiosk runs on a supplied tablet, combined with a stand or wall mount for ease of use; providing an attractive alternative to third party commercially available time and attendance hardware. For more information please contact the Care Systems Help Desk.